King was born in Parramatta, New South Wales on 31 October 1817, son of Captain Phillip Parker King and Harriett (Lethbridge). His grandfather, also named Philip Gidley King, had been governor of New South Wales. As a child, King travelled to England with his father and in 1824-5 attended school near Deptford in London. From 1826 to1830 he sailed under his father’s captaincy aboard MS Adventure, on a voyage to survey the coast of South America. The ship was accompanied by a smaller vessel, HMS Beagle, on her first voyage. Gidley King became midshipman on the Beagle’s second voyage (1831-36) and here met Charles Darwin, who described King in 1832 as ‘the most perfect, pleasant boy I ever met’. He accompanied Darwin on many land excursions during the voyage. They became friends, exchanging occasional letters for many years. In January 1836 King left the voyage to return to his parents in Parramatta. 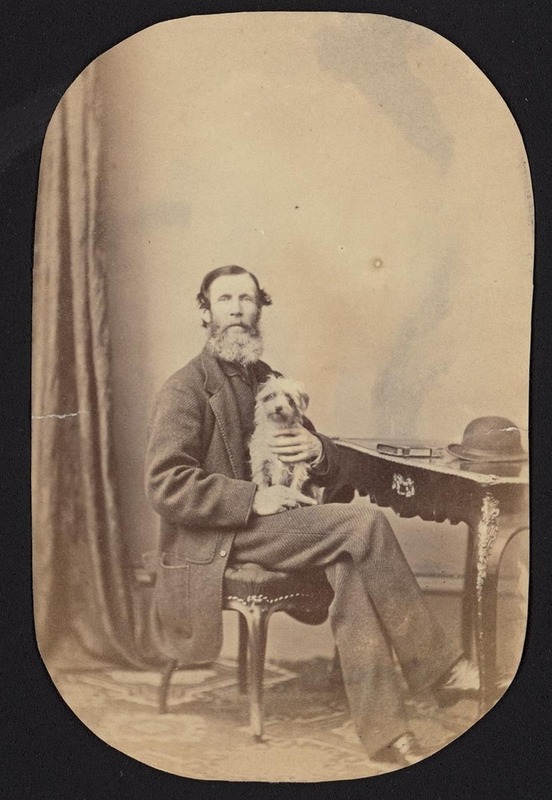 He studied livestock handling and in 1842 joined the Australian Agricultural Company at Stroud, New South Wales. King was initially in charge of the cattle and horse studs and subsequently superintendent of stock. In 1852 gold was discovered north of Stroud on the bed of Peel River. King became manager of the NSW Peel River Land and Mineral Company and moved with his wife (Elizabeth Macarthur) and family to Goonoo Goonoo. The gold rush caused complex issues with independent prospectors but he ran the estate efficiently and was heavily involved in local affairs. King was elected Mayor of Tamworth from 1876-1870. He was also president of the Australia Club and a director of the Mercantile Bank of Sydney. He died on 5 August 1904. PGK’s letter stirred memories of their old days in theBeagle. Gives news of his work on cirripedes. Would like to examineScalpellum papillosumof King from Patagonia if PGK’s father has a duplicate in his collection. PGK’s brother is coming to England and will call on CD. He is impressed but not absolutely convinced by theOrigin. Raises a question about which CD wrote years ago: why do sheep degenerate in Australia, necessitating periodic importation? CD’s photograph evokes PGK’s reminiscence of CD in theBeagle. CD’s queries on expression of aborigines were difficult to answer because he encounters mainly those touched by civilisation. Hopes CD did get answers. Thanks PGK for his aid in reporting the curious case of the parrot. Will consult John Gould about rosella [Australian parakeet]. Recalls with pleasure their friendship on board theBeagle. Australian farmer and mining company manager. Son of Phillip Parker King. Midshipman in HMS Beagle, 1831–6. Settled in Australia in 1836. Entered the service of the Australian Agricultural Company in 1842; superintendent of stock, 1851. New South Wales manager for the Peel River Land and Mineral Company, 1852–81.